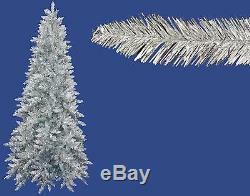 14' Pre-Lit Slim Silver Ashley Spruce Tinsel Christmas Tree - Clear Lights. 14 Foot Pre-Lit Artificial Christmas Tree From the Ashley Spruce Designer Collection Item #K884796. This winning pre-lit tree is an exciting hard-to-find designer silver color. The lights are also a designer color with matching silver wire and clear bulbs. Product Features: 3890 tips 2 inch wide tapered tips Slim profile Pre-lit with 1750 clear miniature lights If one bulbs burns out, the rest stay lit Hinged branch construction 9 foot long green lead cord approx. With foot tapper 5-piece easy assembly (including stand) Lights on tree are UL listed for indoor or outdoor use, however the tree itself is recommended for indoor use only. 120V, 60Hz Comes with spare replacement bulbs, spare fuses and a FREE metal tree stand. Dimensions: 14 feet high Approximate base diameter: 68 inches (at widest point) Distance from the floor to the first row of branches: 7 inches Material(s): tinsel/metal/wire/glass bulbs. The item "14' Pre-Lit Slim Silver Ashley Spruce Tinsel Christmas Tree Clear Lights" is in sale since Friday, November 18, 2016. This item is in the category "Home & Garden\Holiday & Seasonal Décor\Christmas & Winter\Ornaments".